Firefighters in Southern California were able to hold containment lines over the weekend in a firefight that extends from eastern Ventura County to the Malibu coast as they prepared for the unwelcome return of the dangerous Santa Ana winds. A red flag warning, denoting high fire danger, is in effect Monday for area affected by the Woolsey Fire. The 93,662-acre blaze that has destroyed at least 435 structures and damaged at least 24 more, was 30-percent contained as of Monday evening at 7:45 p.m. after a one-day lull in the dry, northeasterly winds ended at midmorning Sunday. A long red line of fire retardant can be seen on a ridge between Hidden Valley and Malibu Springs early Monday Nov. 12, 2018. Authorities warned that the gusts will pick up Monday and continue through Tuesday. Winds are forecast to peak at up to 50 miles per hour. 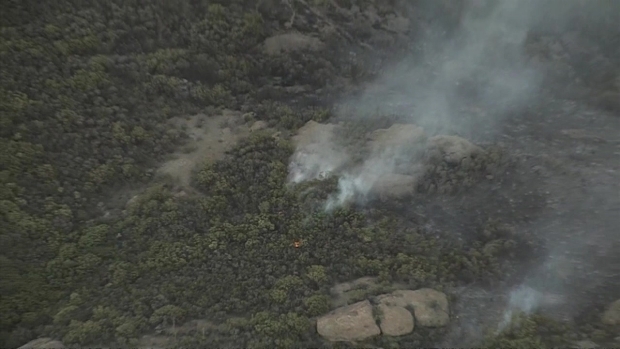 "That is going to be the factor driving these fires," said NBC4 forecaster Shanna Mendiola. "We're going to see the Santa Ana winds, but not as strong as last week." Santa Ana winds, produced by surface high pressure over the Great Basin squeezing air down through canyons and passes in Southern California's mountain ranges, are common in the fall and have a long history of fanning destructive wildfires in the region. A November 1993 wildfire in Malibu destroyed more than 270 homes. The fire -- which began Thursday afternoon -- has forced the evacuation of at least 75,000 homes and an estimated 265,000 people in both counties as it consumed multimillion-dollar mansions and mobile homes. The cause remained under investigation, Cal Fire said. Cal Fire also projected full containment won't come until Nov. 17. The total number of structures threatened was still at about 57,000, with the number of structures destroyed increasing from 177 to 435, with more considered likely as damage assessment was only 15 percent complete. 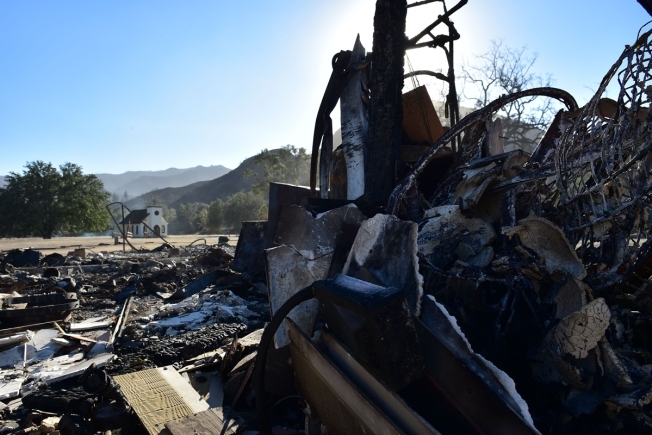 Los Angeles County Fire Chief Daryl Osby said there were flare-ups in several canyons as winds kicked up Sunday, but none outside the footprint of where the fire already had burned. 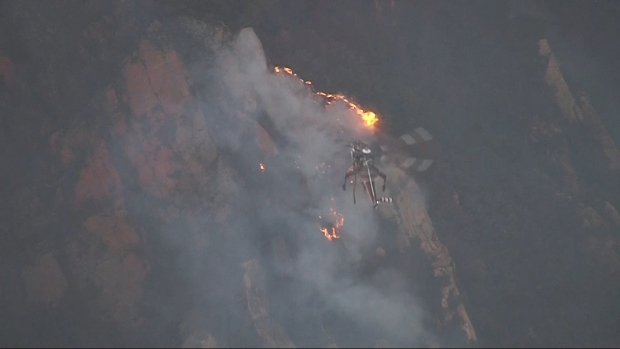 Osby credited the Los Angeles Fire Department with keeping areas to the south, especially in Bell Canyon, "buttoned up" employing some 50 engines on the fire's flank to keep it from spreading south of Mulholland Highway into Pacific Palisades and Topanga Canyon. Several evacuation orders -- including West Hills in the city of LA -- were lifted, but several areas, including Calabasas and Malibu remained evacuated. Some returned to find relief, even as their neighbors were met with heartache and total devastation. The badly burned bodies of two people were found inside a burned vehicle in a long driveway in the 33000 block of Mulholland Highway. "It's the feeling of homicide detectives that the driver became disoriented and the vehicle was overwhelmed by the fire," Benedict said. Meanwhile, firefighters were reporting progress on the much smaller Hill Fire north of Malibu and south of Simi Valley. That wildfire, which has consumed about 4,500 acres and destroyed two structures was 70 percent contained. No civilians or firefighters were killed or injured and full containment was expected Wednesday. Gov. Jerry Brown, responding to the Southern California fires and the Camp Fire in Northern California that has burned more than 100,000 acres and killed at least 42 people to become the deadliest fire in the state's history, announced Sunday he is requesting a "major disaster declaration" from President Donald Trump, in addition to an earlier emergency declaration signed by Trump that will provide federal funds to aid firefighters. On Monday evening, Trump announced that he "approved an expedited request for Major Disaster Declaration" for the state in an attempt to "alleviate some of the incredible suffering going on." The Commander-in-Chief added, "I am with you all the way." A few days earlier, the President drew sharp criticism from various groups, including the International Association of Fire Fighter, for comments he made on social media in relation to the fires. Trump, on Saturday, said via Twitter that "there is no reason for these massive, deadly and costly fires in California." The President added that "billions of dollars are given each year, with so many lives lost, all because of gross mismanagement of the forests. Remedy now, or no more Fed payments!" 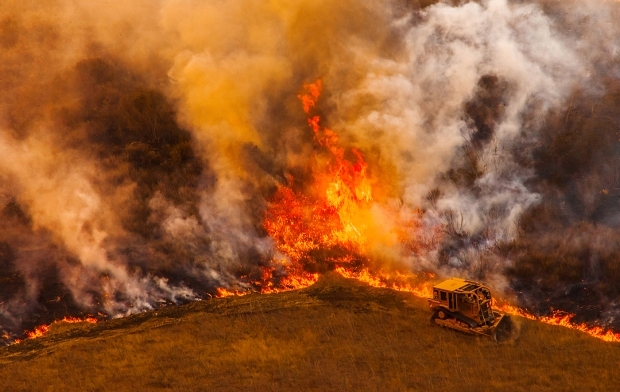 The threat of taking away federal funding at a time when homes were burning, the death toll was rising and hundreds of thousands of people were under evacuation orders was not well received in the Golden State. Fall is historically one of the most dangerous times of the year for wildfires in California, due primarily to strong Santa Ana winds. Seven of the state's 10-most destructive wildfires occurred in October -- many fueled by monster winds, including Santa Ana gusts. Through Nov. 4, Cal Fire has reported about 5,600 fires that burned more than 621,700 acres. 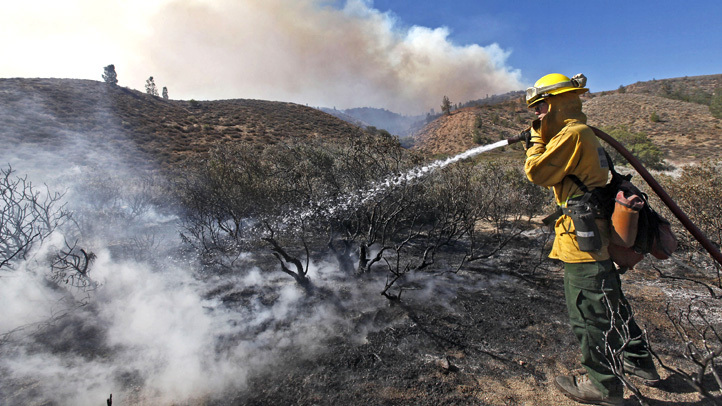 During that same period last year, the agency reported 5,800 fire that burned 316,600 acres. Over the last five years, California has averaged 5,293 fires that burned 231,400 acres during that interval. Since 1970, California is not only seeing more fires, but larger fires. Seven of the top 10 largest have all occurred since 2000. They are the 2017 Thomas Fire in Ventura and Santa Barbara counties; The October 2003 Cedar fire in San Diego County; the August 2012 Rush fire in Lassen County; the Rim fire in Tuolumne County in August 2013; the July 2007 Zaca fire in Santa Barbara County; the October 2007 Witch fire in San Diego County; and the Klamath Theater Complex fires that burned in June 2008 in Siskiyou County. Shahan Ahmed contributed to this story.